Welcome to North Fork Cabin Rental's Bear Paw! We are family owned cabins nestled in the Blue Ridge Mountains. Our cabins are less than one hour driving distance from attractions such as the Blue Ridge Parkway, Crabtree Falls, Montebello Fish Hatchery, Oak Ridge Estate, Wintergreen Ski Resort, Rockfish Valley Restaurants, Wineries and Breweries, Walton’s Mountain Museum, and Appalachian Trail. We are also within an hours time of Lexington, Lynchburg, Charlottesville, Staunton, and Waynesboro, Virginia. All cabins are modernly equipped and ready for your stay. Come explore the Blue Ridge Mountains! Due to mountain terrain, cell service is not available.There is a landline phone in cabin for local and emergency calls.internet wifi is available .Fire Wood is not furnished for campfires. Landline phone for local and emergency calls. Awesome Rustic getaway. A true Gem. 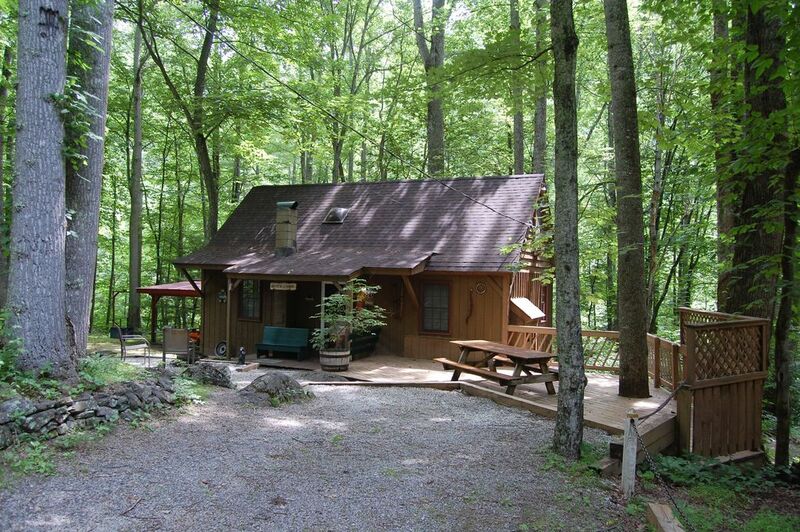 Wonderful cabin and access to the beautiful creek! Will definitely stay again! Left the window open to hear the water and slept like a baby! Another excellent weekend in the mountains. Clean, quiet, and sized just for me and my two boys. Had all the needed amenities. The location is great, on the foot hills of some nice sized ridge lines, with a river down the hill behind the house that my two boys played for hours around. The cabin's kitchen, dining, and living room areas were perfect for the three of us to prepare food, light a fire, and watch movies at night (we did all of our cooking outside). Outside was a charcoal grill and camp fire that both saw daily use. The wifi was reliable, but only for texting and voice calls on FaceTime, I could not text pictures, but again, this was enough. General store is 6-8 miles away, and Crab Tree Falls is 5 miles away and provided us with a 3-hour hiking excursion up the mountain. This was the perfect spot for our 2 night excursion. When we arrived at Bear Paw it was snowing. The view of our weekend retreat was stunning. Once we went inside we fell in love. The cabin was perfect for our weekend getaway. We were able to enjoy the fireplace as we relaxed for the evening. We also had a great night’s sleep on a wonderfully comfortable mattress and woke up ready to explore the mountains the next day. Hopefully we will be back in the warmer weather to explore some of the trails. Than’ you for a great place to get away with my hubby. Cabin was in good condition and comfortable for our party of 3. Rained most of the weekend so we enjoyed the DVDs. Kitchen had everything you need to cook meals, a baking sheet would be a good addition. Would definitely come back to this place.